In the theatre when a show closes we never say farewell or goodbye. We say "see you on the next show." We're used to comings and goings, arrivals and departures, between which we build quick, passion filled relationships in the heat of rehearsal and the joy of performance. We know going in those times are going to end on closing night. We experience a lot of goodbyes that we hope will only be temporary, but often, like in real life, they are not, and yet we know we delude ourselves in the end. When I read of Marc Orchant's passing last night, I was moved more than I expected to be, given the news that his friend Oliver Starr had been keeping us abreast of during this week. I knew before Marc was stricken that he was one of those special and rare individuals you get to walk with in life. The reality of losing him hit much harder than I was prepared for. It was amazing, though not surprising, to see how much others felt the same way as I watched the outpouring of love, concern, and finally sadness that went broiling over the Internet during this past week. And in some ways that is more than fitting. Marc, for all the many wonderful things that he was, was a life that lived on the Internet. The reams of words that are being written about him now are a testament to both the large number of lives he touched, and the way he was able to do that touching. Here are some of my indelible memories of a friend now sadly gone. 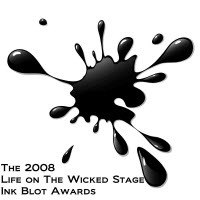 When I first started blogging, moving my thoughts about Tablet PCs from the forums of TabletPCBuzz to a blog called Life On The Wicked Stage, Marc was one of my first readers and subscribers. He linked to those first blog posts and waved a flag that he has waved for so many, saying take a look at this, pay attention to this. And because it was Marc, others did. So, in many ways, writing this today goes directly back to Marc and his gracefully aggressive way of sharing what he thought needed to be shared. He not only encouraged me and offered me advice along the way. 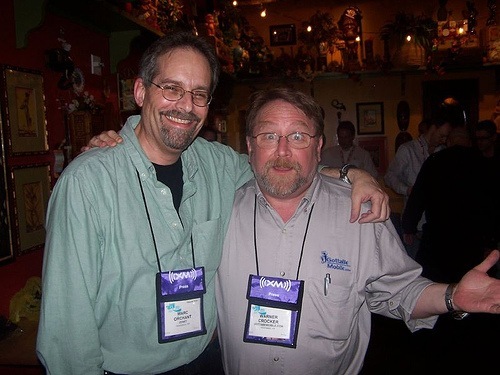 He, along with his podcasting cohort James Kendrick, were friends enough to tell me when I was doing something wrong, which I often did, and probably still do. I'll never forget that kindness. Warner: the fact that you don't "think about it" is why you're so successful at it. Being a connector is not the same thing as a being a networker. The former is a natural proclivity intrinsic to your nature. The latter is practiced craft with personal gain factored in. Not saying that's bad per se – but it is different. Knowing you as I do, your good humor and ease with people makes you a natural! That comment while directed at me, is also so telling about its author, and so much of what Marc was. He connected so many of us to so many more of us and with his passing continues to do so. Marc is also largely responsible for my gadget addiction. Listening and reading about the ways he used technology in his life led to many more purchases of more gadgets than I care to think about. When Marc loved a gadget, or a product, or a service, (or for that matter a movie) it was infectious. More importantly on that front, Marc cut through the chatter and helped me understand that the right tool is the best tool, regardless of the job at hand. His platform agnosticism was another infection he gave to me, and he took great joy when I finally purchased my first Mac just a short time ago. Not only did he take joy, but he sent me so much unsolicited advice about what to do and what not to do, that I still haven't gotten through it all yet. Lastly, I'll share this. I'm one of the lucky ones. I got to meet and talk with Marc in person last year at CES. I was standing with the GottaBeMobile team as we were conducting an interview with OQO's Bob Rosin in some hallway somewhere. This tall, lanky, and very focused individual came strolling down the concourse, bent on reaching his destination, and our eyes met at the same time. Without a word spoken, Marc walked up to me and gave me a hug, which was just as quickly returned. We chatted briefly on this first meeting and then got to do more of that at the Tablet PC and UMPC Meetup a day or so later. We talked about Tablet PCs and UMPCs of course, but also about Marc's daughter's love for the theatre, music, and so many other things. That conversation was as all embracing as that first hug and the warmth of it still lingers. Marc hugged us all in many ways on many days and those hugs will be missed in many corners around the globe.